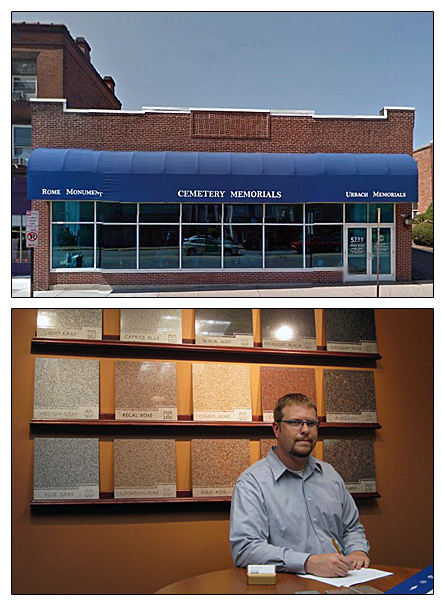 Visit the Rome Monument and Urbach Memorials showroom in Pittsburgh, PA. Call 412-421-8655 to schedule a meeting to discuss a memorial, headstone or monument design. For over 75 years, the Urbach Memorials company has been designing and producing distinctive monuments and tombstones for the Jewish communities and Jewish cemeteries in Pittsburgh. In 1933 Joseph Urbach established Urbach Monument Works. Joseph's son, Steven, joined his father in 1965 and expanded the business by offering cemetery lettering, memorial repair and cleaning. Heath Peterson is now the manager of Urbach Memorials. Rome Monument purchased Urbach Memorials in 2008. In 2012, Urbach Memorials, a division of Rome Monument, donated a 6-foot-tall, 3-ton granite monument to the New Light Cemetery, in Shaler Township, PA. In 2010, Rome Monument and Urbach Memorials restored 30 destroyed gravestones discovered in the Beth Hamedrash Hagodol-Beth Jacob Cemetery in McKees Rocks, PA. Urbach Memorials works with the Beth Hamedrash Hagodol-Beth Jacob congregation.